You know what they say about hindsight. Well, when it came to picking a stroller, we didn’t make the right decision for our family. As with everything else, I did a ton of research, got people’s opinions, test drove strollers, basically did everything right. We ended up with a Baby Jogger City Mini. And we loved it. I mean, really, really loved it. I would totally recommend it to anyone. It’s lightweight, folds up beautifully, the steering was lovely. BUT, it’s a single stroller. We knew we were planning on having more kids someday soon, but we still bought a single stroller. I think we just decided to figure out the double stroller if, and when, it became necessary. Here’s the deal. This totally wouldn’t be a problem if you space your kids out further than we did. 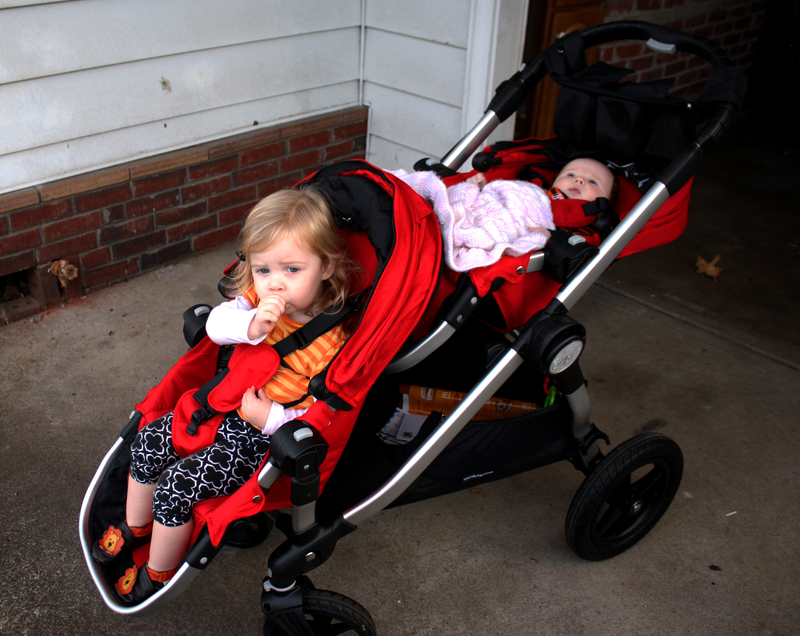 With only 19 months between Alma and Harriet, I knew we would need a double stroller. I have friends who have added a standing board for their older kids, or just had them walk. Not an option for Alma. And we also like to use the stroller to go on long walks. I can’t expect Alma to walk the whole way, or want to strap a big baby or toddler to my body. This isn’t just for the grocery store or the mall. I basically have two babies to push around. Double stroller necessary. What I wish I had known the first time around: There are stroller options that convert from single to double! What?! Ha! After doing lots more research, asking, test driving this time around, we came to the Baby Jogger City Select. This stroller is ah-mazing. It can be configured a gazillion different ways. I’ll, again, refer you to the website so you can see all the beautiful things this stroller can do. I love that both kids can see out when they are both front facing. Since we go on walks, I like to use that time to show them the world. Especially when we’re down by the river, or downtown. I also love that they can face each other. I think they love that, too. I also really love that it can also be a single. This is good for quick trips, when I just need to have Alma contained, and can carry Harriet in my Ergo. The fact that it can be a single will extend the life, too, since we can keep using it when Alma has outgrown strollering. The down side is that it comes with a pretty hefty price-tag. We were able to get it when they were offering a deal where you got the second seat for free. We were also able to sell our City Mini (Baby Jogger strollers hold their value really well! ), so that helped a lot. I *wish* we had just bought the City Select single when we had Alma, then we would have just had to buy the second seat when Harriet came around. That would have stretched the life of the stroller for us. Well, that’s my opinion, for whatever it’s worth. Nobody paid me anything to write this. I didn’t get any free strollers or anything. I just love the products, and wanted to share! If you missed my run-down of other baby gear, be sure to check it out here. I’ve been mulling over this post for a while. I’ve been trying to come up with some of the things that I would tell newly pregnant friends that they must have. There are so many things that go into making choices when it come to everything, but it seems especially difficult when it comes to baby gear. Probably because you get it all at once. While working on this post, I came to the realization that our main criteria was definitely whether or not the baby would grow out of it quickly. If we felt like it wouldn’t last for at least the first year, we tried to find another option. I don’t think we were consciously thinking of this, but it was definitely a selling point if we could see the usefulness of an item for quite a while. Obviously, borrow things from friends where you can, or buy used gear! 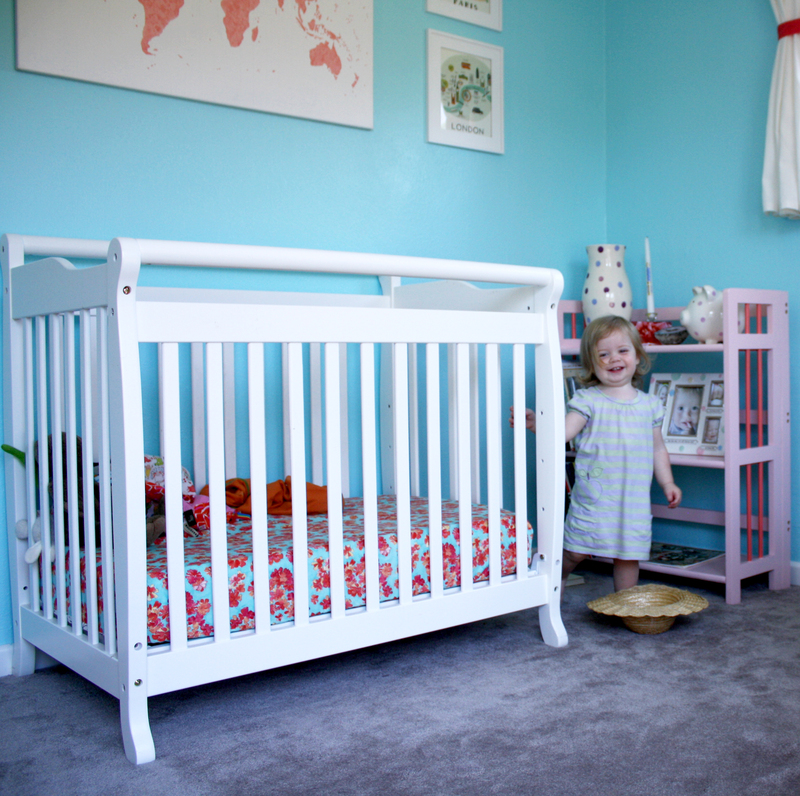 Mini Crib: While this doesn’t sound like something that will follow your baby into childhood, this is one of the best things we bought. While it is (as its name implies) smaller than a regular crib, many mini-crib models can be converted into twin beds. Some full size cribs can be converted into full size beds, but that doesn’t make sense to me. Knowing the size of my daughters’ rooms, a full size bed wouldn’t be very useful. They will eventually need twin beds, so might as well buy something when they are babies that can work for that. 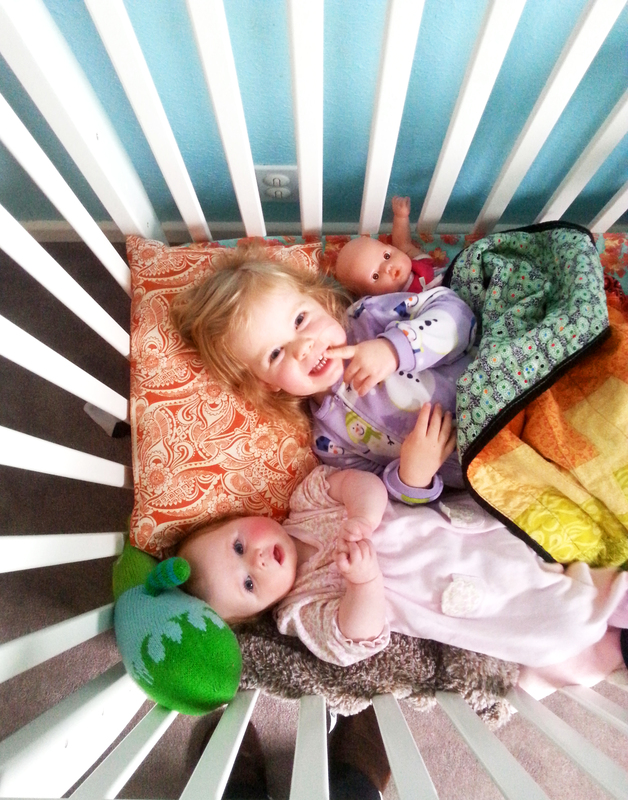 I know that one of the draws of full size cribs is that they often convert to toddler beds. I can understand the convenience of this, but not the necessity of it. As of today, Alma is still in her mini-crib. She’s over 2 years old, and was just about 3 feet tall at her check-up last month. She fits comfortably, and I think she will for quite a while. She hasn’t been able to climb out of the crib, either. I imagine when we’re ready to move on from the crib, we’ll get a twin mattress, and put it on the floor for a few weeks or months, then bring the head and foot board in to make it a real bed. The crib we bought for both girls is the Da Vinci Emily Mini. It comes with a “mattress” that is about an inch thick, and not suitable for sleeping in my opinion. Da Vinci also sells mini-crib mattresses, so we got those too. They also sell a converter kit to make it into a twin bed, but as far as I can tell, it is just a long 1×4 with another ledge attached. I think we will DIY this when the time comes. 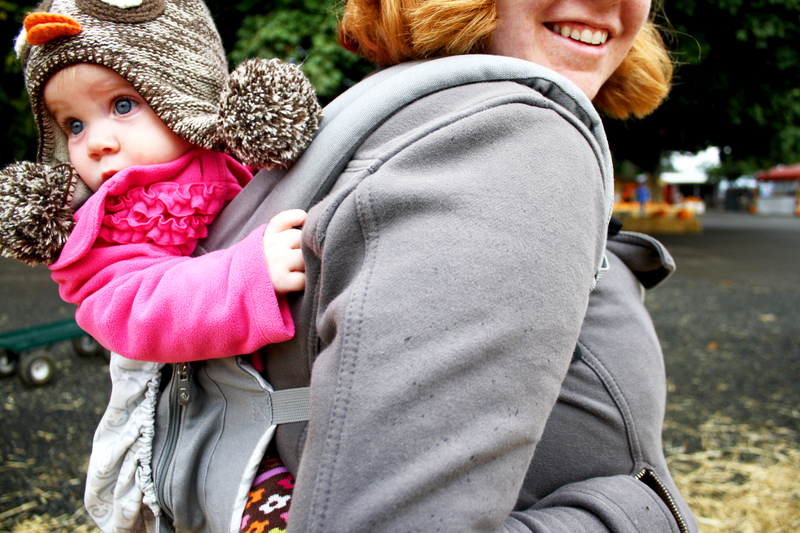 Ergo: There are soooo many different kinds of baby carriers out there. I’m sure there are other great ones, but I really love our Ergo. It has carried us (ha! that’s a pun!) from teeny tiny newborn, to full on baby, into toddler-hood and we’re still going! We also have a Moby, but I use the Ergo much more. The infant insert was great for when the babies are super small. My favorite carry for when Alma got bigger is the hip carry. It’s great because Alma can see everything, but she is still cuddled up next to me. It’s also nice to throw the baby on my back (as seen above) for a longer walk. I’ve even put Alma on my back like this, and had Harriet in the Moby on my front at the same time. Pretty great if you ask me. Convertible Car Seat: Oh man, car seat shopping was the most overwhelming part of baby gear buying for me. I went on Consumer Reports, made spreadsheets, read forums online. Holy cow. I knew this was an important safety decision, but also quite an expensive purchase, so I wanted to make sure we’d be happy with it. We went with a Britax convertible seat. This basically means that the car seat works from the time your baby is a newborn, until they are huge. They can be both rear, and front facing. They don’t come in and out of the car like infant only car seats. This wasn’t an issue for me, since I always had the Ergo. I do have to say that we got to borrow my nephew’s infant car seat for Harriet, and we really appreciated the convenience of it, but we have already switched to the convertible for her. It got to be way too heavy once Harriet got bigger. So, if you can borrow an infant seat, go for it! I just don’t think it’s worth the money so buy two car seats when you can easily get by just buying one that will last for a few years. 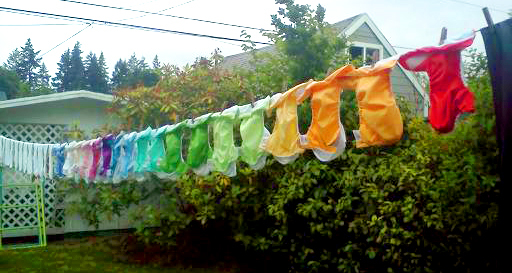 Cloth Diapers: This is our biggest money saver. For sure. We did the math when Alma was a few months ago, and after buying 18 diapers (our magic number), we had them paid off (in terms of what we would have spent on disposables) in about 3 months. Can you even believe that?! We could have kept our child diapered for only 3 months with what we spent on buying cloth diapers! Even with the extra laundry (one load every 3-4 days for us), they are way cheaper than disposables. I know there are lots of other great reasons to use cloth diapers (environment, health, cuteness, etc) the money was really what sold us. But they are pretty damn cute! 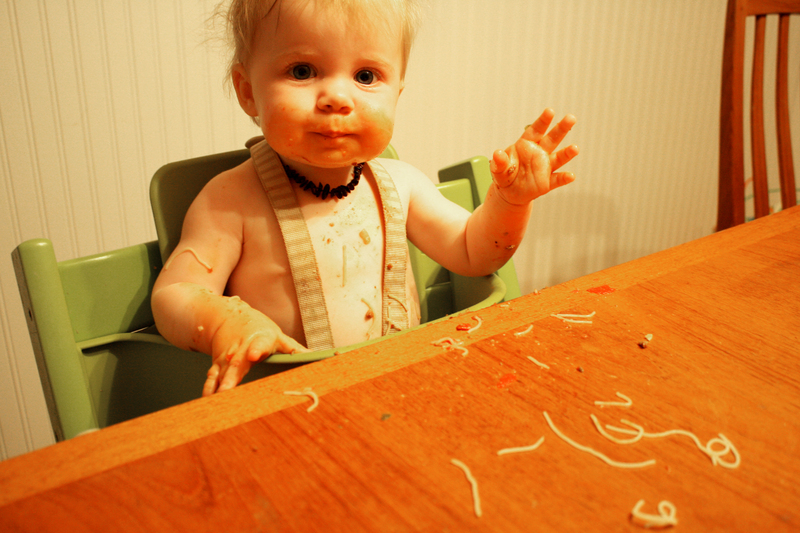 Tripp Trapp high chair: To fully understand the genius of this chair, I will refer you to the Stokke website. This chair grows with your child. The seat, and the footrest are adjustable, so when they grow, you can just lower it. This allows your kids to always be able to sit right up to the table, have proper posture, and have a firm place for their feet. The most important thing to me was having out kids at the table with us. Dinnertime is important to our family. Harriet is already sitting in her Tripp Trapp at our table, even though she’s not eating solids yet. I like that both kids are right there, part of the family, not off to the side. Clean up is easy, too. We just wipe down the table or place mat. I love it. There you have it! These are my favorite ways to save some money and spend wisely. I have lots of other recommendations if have any questions. 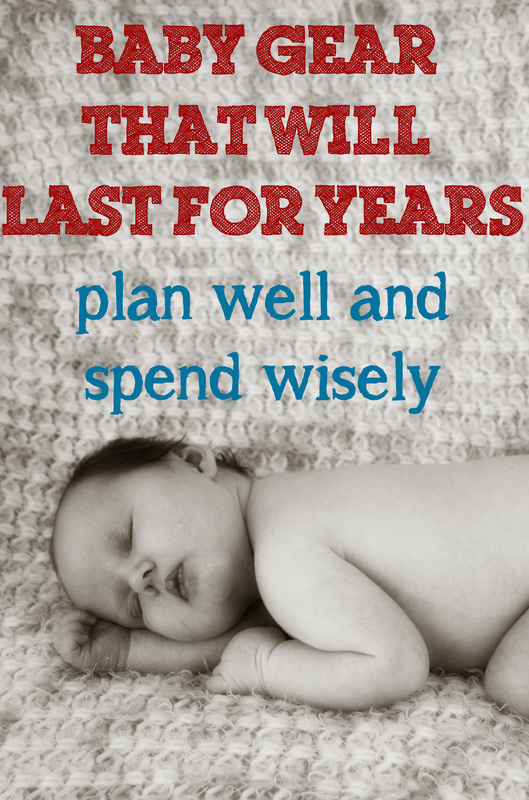 What are some ways you saved some money or made some decisions when it came to baby gear?